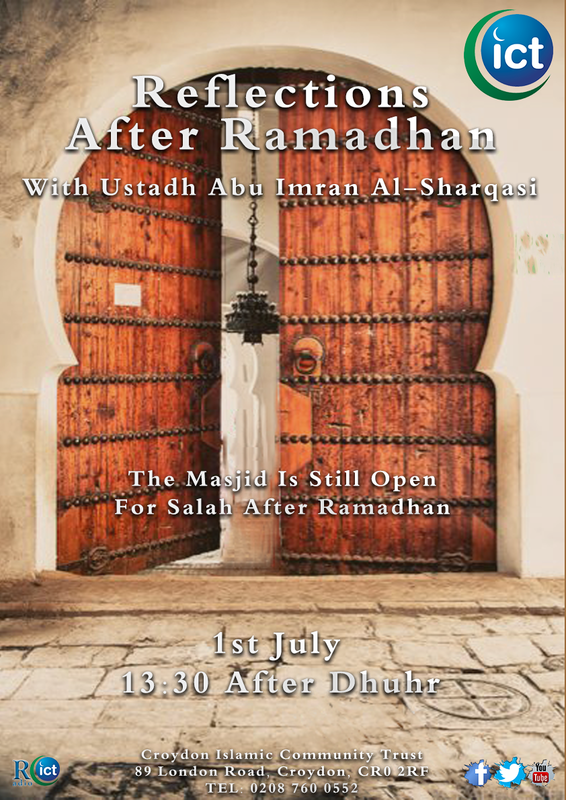 We are pleased to have Ustadh Abu Imran Al-Sharqasi with us this weekend to reflect on the month of Ramadhan that has just left us. Ramadhan has ended, does it mean that salah in Jama’ah has also ended until next Ramadhan ? Did you benefit from Ramadhan ? What did Muhammad (salillahu alaihi wa salam) do after Ramadhan ? what did the Sahabah (radiallahu anhum) do after Ramadhan ? What should we be doing after Ramadhan ? What lessons should we have learned from a month of fasting and increased ibaadah ? This entry was posted in Events, News, Seminars by Admin. Bookmark the permalink.